These beautiful crepes are light and gluten-free, making for a wholesome and delicious breakfast or brunch. Note: Allow overnight for yogurt preparation. Allow min. 3 hours to overnight for batter to rest. Recipe and food styling courtesy of Linsey Bell. Photo by Rob Davidson. 1. In a large bowl, place the gluten-free flour blend, buckwheat flour, poppy seeds, salt and sugar. Whisk to combine well. 2. In a separate, small bowl, place the eggs, butter, milk and (optional) vanilla, whisk to combine well. 3. Mix wet and dry ingredients together. Whisk until very well combined. The batter will thicken a bit as you whisk. 4. Cover the bowl and place the batter in the refrigerator overnight or for up to 2 days. Before using the batter, remove it from the refrigerator, whisk until smooth, and allow it come to room temperature. The batter should be about the consistency of half and half (thicker than milk, thinner than heavy cream). The batter will thicken as you whisk. Transfer the batter to a large spouted measuring cup. 5. Heat a nonstick 12” crepe pan over medium heat for 2 minutes. Holding the warm skillet just above the flame, carefully pour almost 1/3 cup of batter right into the centre of the skillet and swirl the pan to distribute the batter evenly across the entire flat surface of the pan. Once you get a rhythm going, you should be able to begin swirling as soon as the first drop of batter hits the pan. Cook over medium heat until the edges and underside of the crepe are lightly golden brown (about 90 seconds). 6. With a wide spatula, turn the crepe over and cook until the other side is lightly golden brown (about another 45 seconds). 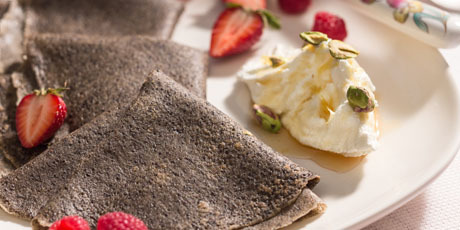 Slide the crepe out of the skillet onto a parchment-lined plate. Repeat with the remaining batter, stacking the finished crepes on top of one another. 7. The crepes may be covered with a warm moist towel and kept at room temperature for about 2 hours until you are ready to serve them, or wrapped tightly in freezer-safe wrap and frozen until ready to use. 1. To begin the process of making Greek-style yogurt, simply place the yogurt in cheesecloth (3-4 layers thick) in a fine strainer over a bowl. Cover the top of the yogurt with the edges of the cheesecloth. Cover the strainer and bowl with plastic wrap to ensure freshness. The yogurt/cheesecloth should not touch the bottom of the bowl. The yogurt will strain its whey (liquid) over the next few days. Do not allow the whey (liquid) to come into contact with yogurt. 2. When the strained Yogurt has reached a consistency that you are pleased with gently fold in lemon juice, rind, honey and optional vanilla. Place the yogurt in a serving plate. Top with berries. Garnish with roasted or raw nuts to add an extra flavor and crunch to the yogurt.